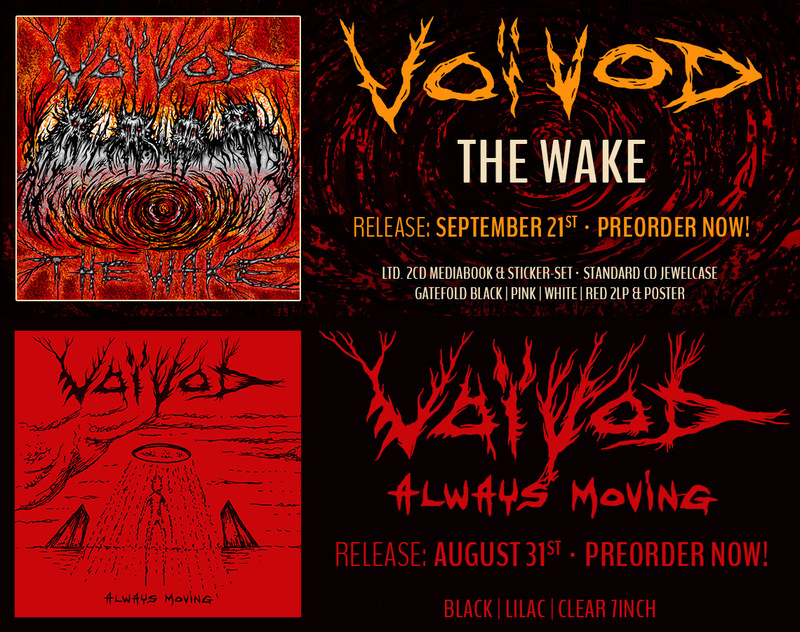 Celebrating their 35th anniversary this year, Canadian progressive sci-fi metal innovators VOIVOD are pleased to announce a release date of September 21st, 2018 for their upcoming new studio album “The Wake” via Century Media Records worldwide. The first single off “The Wake” is expected for release on July 20th. Bio-Cancer (from 28th Sept until 20th Oct). hey, don’t forget to change 08.08.2018 for the Lévis’s show to august 4, 2018. I wish you guys would come to the Pacific Northwest again sometime. Saw you in Seattle on the Outer Limits tour, love to see you again. Looking forward very much to The Wake. Post-Society is an amazing recording. The emotion pouring out is almost overwhelming. By the time I get to the end of the EP, I feel like *I’ve* just been for a ride on a silver machine! Merci beaucoups! Way to go, Chewy!! You had some might deep, wide, and seriously angular shoes to fill … and you did it!! Right to the brim and then some! And thanks, too, for the clip about Mr. Holdsworth. Just like you, I bet, that solo off the first UK album was the first I heard of him, and I remember hearing those first dozen or so notes and being stunned into momentary immobility, thinking, “What the … is *that*?” and being hooked immediately. I really like how you take off from Piggy and add the Holdsworth in. Again, way to go!! Please book multiple dates in the LA area. The show at the Whisky was phenomenal! I hope to see you there again. I wish you well on your European tour. Just pre-ordered this. I heard the single and love the sound. Voivod fan since the beginning, We are connected! Please come to Seattle and Portland in 2018/2019. Obsolete Beings sounds excellent on every level; very excited to hear the rest of The Wake when it releases in Sept. Thank you for continuing to create and grow at the level that you do musically and lyrically. I’ve loved Voivod since the Dimension Hatross days. Now 47 and bringing my son who is 15 to his first ever gig in Manchester (travelling from Liverpool). He practices his guitar every day and can’t wait to see dad’s all time favorite band! His name is Matthew and he will be taking notes Chewy. No pressure! Voiivvvvvooooodddd!!!! 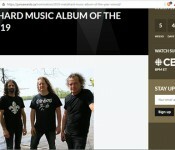 Here’s my view on the new Voivod album. I really love it. I’ve only listened to it twice so far but I think it may be one of their best since Dimension Hatross. Having been a huge fan ever since hearing War And Pain back in ’84, Voivod has continually been one of the most innovative bands, metal or otherwise, and this album is another instance of that. From the opening track, Obsolete Beings, to the albums closer, Sonic Mycelium, (there’s a 2 cd version of this album that has stickers, a mediabook, and the 2nd cd includes the great Post Society ep and some killer live tracks recorded earlier this year on the 70,000 Tons Of Metal cruise), this album delivers all the things one would expect from a Voivod album, with the usual dissonant guitars, frenetic time changes, slightly odd phrasing in the arrangements, vocals that range from screaming to clean, almost straight up singing. If you’re ever in the position to catch them live, don’t miss out as they are an incredible live band. It’s been almost 35 years since the release of War And Pain in ’84, and throughout the line up changes and stylistic changes, they’ve always held on to the things that make them such an original sounding band. In 2005, they suffered a huge loss when original guitarist (and one of the nicest people I’ve ever had the pleasure of meeting), Denis “Piggy” D’amour, passed away, succumbing to cancer. I thought it would be over for them, as I thought, due to his most original style of playing and songwriting, that they would never find a suitable replacement for him. I was proven wrong when they added to their ranks Martyr guitarist Dan Mongrain aka “Chewy”, who I first saw (on video) standing in for another local band, DBC (Dead Brain Cells) guitarist Gerry Ouelette, who passed away in Nov. 1994. 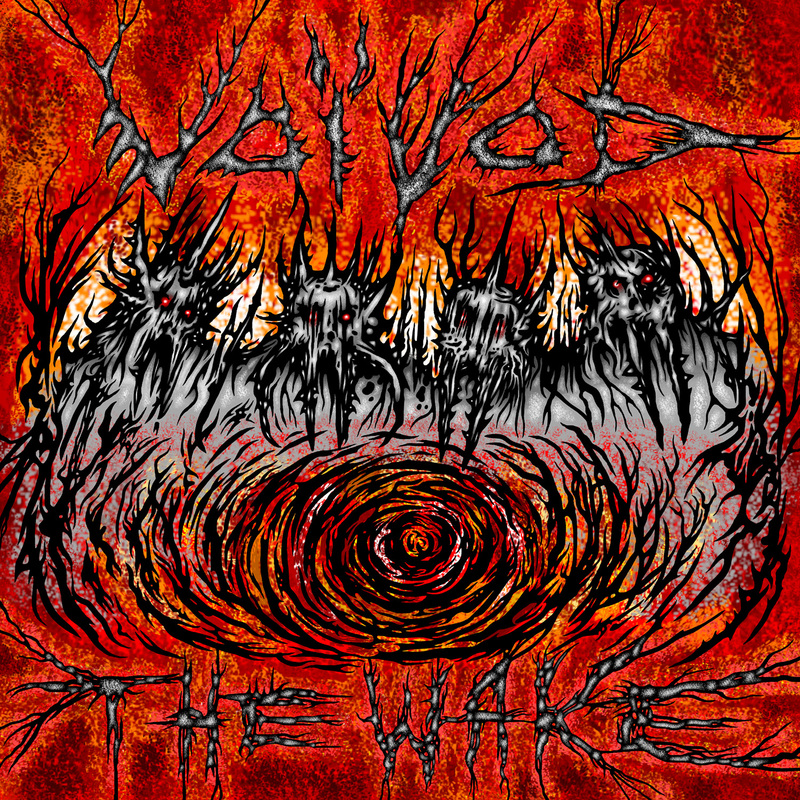 Anyway, I’m getting off track here, but my overall thoughts on the album are that it is a great addition to their catalog, featuring all the hallmarks that make Voivod such a great and again, original sounding band. It fits right in with their overall concept, which has developed since War And Pain and keeps on progressing album to album. If you’re already a fan of the band I think you’ll be pleasantly surprised with the quality of the songwriting and particularly the guitar sound and playing, as this is the 2nd album to not feature any of Piggy’s music (the first being Target Earth. The band’s last studio album to feature Piggy’s music, Infini, was made up of riffs and unfinished songs that Piggy, who knew he was on borrowed time, had put onto tape for the band to create the album from). This album’s guitar is all Chewy, who again has done a fantastic job of recreating the feel and sound of Piggy’s totally original sound and technique, while also maintaining his own stamp and sound as a very accomplished guitarist. Ok, I’ve really written way more than I planned on but, suffice it to say this is a great album and worth picking up, whether you’re a longtime fan or someone new to the Voivod fold. I give this album a 5 out of 5 stars. 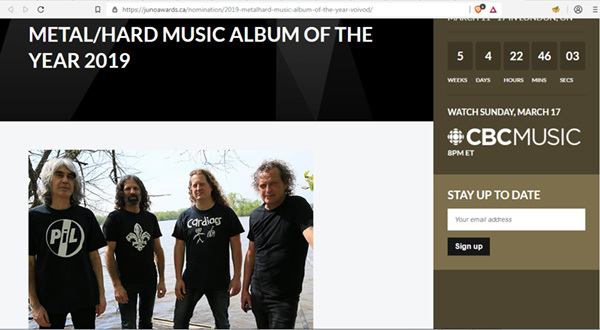 Now go buy it and get lost in it’s pseudo psychedelic metal….you won’t want to come back to reality…..Voivod’s reality is so much more interesting.